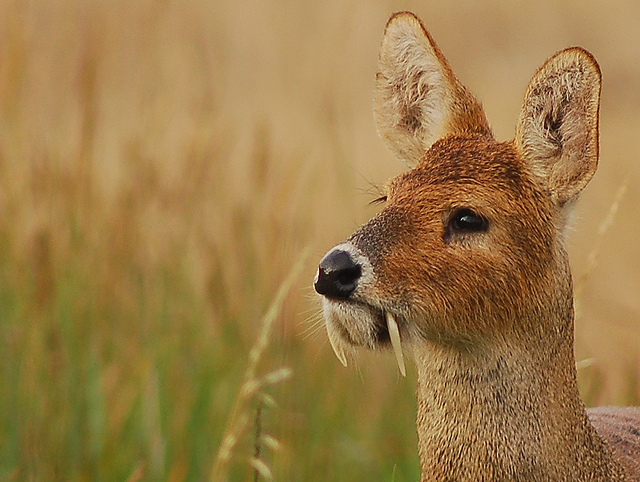 Today I want to write about a very special animal that has really cool fangs, the Chinese water deer. These beautiful animals grow up to 1 metre long and 55 cm high. Instead of the usual antlers that other deer have, male Chinese water deer have long canine teeth that measure up to 8 cm long and look like fangs. They are very territorial and males will often fight with each other, using their fangs to stab each other on the head, shoulders or back, often leaving large scars. They are excellent swimmers and can swim several kilometres between islands. Most often, females will give birth to 2-3 young at a time, but 6-8 is not uncommon, which is the largest number of offspring for any deer. They can stand up within one hour of being born and are very good at hiding. Chinese water deer are found in China and Korea. They have also been introduced into the wild in England and France. The English population has been very successful and now makes up about 10% of the total number of Chinese water deer in the wild. Are there any other interesting facts that you would like to share about Chinese water deer?